To validate the program protocols in as many environments as possible, the Long-Term Bridge Performance (LTBP) program selected test bridges in seven States that provide a fair representation of the environmental conditions and types of structures throughout the United States. The primary objective of the LTBP pilot study is to validate the methods and protocols developed for data collection under the developmental phase of the program. The experiences and results from inspecting, instrumenting, testing, and monitoring the pilot study bridges will be a major determinant in the final design of the various LTBP experimental studies. In addition to assessing the effectiveness and usefulness of the chosen data protocols, the pilot studies will provide critical knowledge on: key factors in coordinating with bridge owners, difficulties in accessing components of the bridge, maintaining safe and satisfactory traffic flow during onsite activities, realistic costs associated with all aspects of the field testing, issues related to durability and reliability of instrumentation and data transmission methods, and mobilizing data collection technology from one region to another. Figure 1. 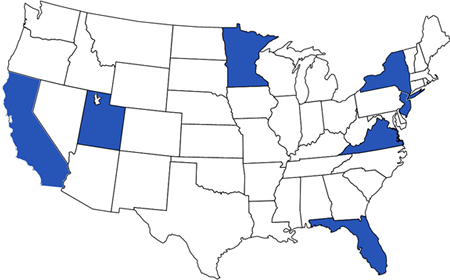 Map representing the seven States chosen for the LTBP Pilot Study. Seven pilot bridges are being chosen to represent a cross-section of the most common superstructure types and environmental conditions seen throughout the United States. The bridges are located in California, Florida, Minnesota, New Jersey, New York, Utah, and Virginia, creating a broad geographic distribution. Selection criteria are also established to ensure that as many variables as possible governing bridge performance can be examined during the pilot phase. Thus far, pilot bridges have been selected in four States: New Jersey, California, Utah, and Virginia. All are highway overpasses typical of the bridges that the LTBP program will focus on. In New Jersey, a simple span, steel multi-girder structure with a cast-in-place deck built in 1969 has been selected. This bridge (Interstate 195 eastbound over Sharon Station Road) is located 13 miles east of Trenton and used by approximately 25,000 vehicles per day (14% trucks). With a traffic camera, weigh-in-motion system, and weather station on site, the bridge is already equipped for long-term monitoring of vehicular and environmental loading. The bridge in California is on Interstate 5 southbound over Lambert Road located a short distance south of Sacramento. Constructed in 1975, the bridge is a two span pre-stressed post-tensioned cast-in-place box girder structure. The average daily traffic is approximately 24,500 vehicles, 21% of which are trucks. Of particular interest on this bridge is the condition of the embedded post tensioning tendons. The Virginia bridge, located on U.S. Route 15 over I-66 at Haymarket, VA, is a short drive from the District of Columbia. The bridge is a continuous two-span, built-up steel girder bridge constructed in 1979. The average daily traffic is approximately 16,000 vehicles, of which an estimated 6 percent is truck traffic. The bridge has a cast-in place concrete deck with no overlay and no stay-in-place forms that allow visual access to the deck's top and bottom sides. The deck itself is beginning to display early signs of deterioration, which will be key in validating NDE techniques and other instrumentation focused on identifying deterioration in bridge decks. 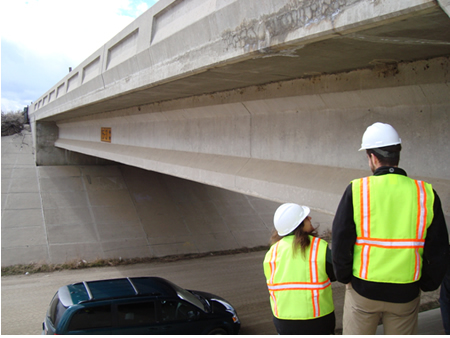 Located in northern Utah near Utah State University, the Utah pilot bridge is a single-span, precast concrete girder bridge with integral abutments. This bridge (I-15 over Cannery Road just west of Perry, UT) has a waterproof membrane with an asphalt overlay, which will enable the program to validate that the proposed data collection methods will work with overlays. Many States have indicated that failing joints are a major concern—one that leads to additional performance issues. By selecting this bridge in Utah, the LTBP program will obtain an early look at a jointless structure, which will help researchers identify key performance issues to be investigated on similar spans. Figure 2. Utah I-15 Bridge. Bridge structures, such as the Utah pilot bridge (pictured), are routinely examined on a number of criteria to determine lifetimes. A variety of tools are being employed at each pilot bridge to establish a baseline condition for long-term monitoring. A detailed visual inspection is performed at each pilot bridge using ScanPrint software. 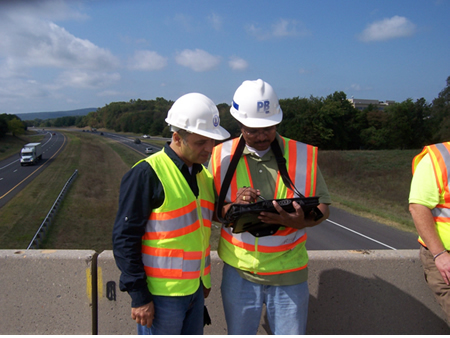 By using tablet PCs in the field, the software allows inspectors to record the size and location of a defect directly onto a bridge plan. Protocols for a segmental inspection system are also in place, aiding inspectors in accurately locating defects on the bridge schematic and enabling the layering of the visual inspection results with other data collection methods. The LTBP program's pilot study bridges are also being evaluated using a suite of cutting-edge nondestructive evaluation (NDE) technologies that includes the use of impact echo (IE), ground penetrating radar (GPR), half-cell corrosion potential (HCP), and resistivity measurements (RM). This combination of tools allows the LTBP program to evaluate corrosion in a bridge deck throughout the bridge's entire life cycle, even before it is discernible on the surface, from detecting corrosion potential at its earliest stages to characterizing ongoing delamination. Ground truth calibrations and validations of NDE surveys are provided through examination of several cores taken during deck testing. Visual inspection and petrographic analysis of concrete cores reveals the condition of the reinforcing steel and surrounding concrete. Additional deck testing includes measuring chloride content, cover depth, concrete resistivity, corrosion rate and potential, and concrete carbonation. Figure 3. FHWA LTBP Program Manager Hamid Ghasemi (left) and an infrastructural expert examine plans on site. Periodic live load testing will be performed at the pilot bridges to highlight changes in structural behavior of the bridge system and critical detail behavior over time. This data helps determine the correct boundary conditions of a bridge and create an accurate finite element model (FEM). Live load tests are performed with heavily loaded trucks making multiple passes over the bridge at various speeds and orientations while the bridge is carefully instrumented. Dynamic testing is being conducted at pilot bridges using an electrodynamic force generator, known as a shaker. This state-of-the-art testing method reveals the natural frequencies, stiffness, and mode shapes of the bridge, providing valuable data to calibrate the FEM. After the initial baseline testing, long-term instrumentation is being installed at each pilot bridge to monitor weather conditions, load/traffic history, and resulting stresses/strains in critical bridge components. Analyzing this data periodically will provide a better understanding of bridge deterioration. The LTBP pilot study is anticipated to last for two years and its outcome will provide crucial information for the long-term data collection. It is important that the pilot study not be viewed as independent of the long-term data collection phase of the program. Therefore, the selection, instrumentation, and data collection of the pilot bridges will be consistent with the overall long-term data collection objectives of the LTBP program. This will ensure that the information gathered will feed directly into the long-term phase and provide early results to important questions that can be answered on the basis of the short-term data and knowledge that the program creates. On behalf of the FHWA, I welcome you to the first issue of the LTBP newsletter! I invite you to join our mailing list and stay informed about the developments of our flagship program, the LTBP Program. In our premiere issue, we introduce you to the program and highlight current activities. We're looking forward to the progression of the LTBP program in advancing the knowledge of bridge performance, and remain confident that we will meet the program's objectives and ultimately improve the way bridges are maintained, managed and built over the long-term. Just as a little background, the LTBP program was launched in 2008 as a 20-year (or longer) major research effort to address a number of objectives, such as achieving a deeper understanding of bridge performance, developing methods to measure its reliability, and using those measurements to improve the performance of the highway transportation system. Funding for the program was included in legislation for surface transportation programs enacted by the U.S. Congress in 2005, the Safe, Accountable, Flexible, Efficient Transportation Equity Act: A Legacy for Users (SAFETEA-LU). FHWA will use the knowledge gained from the LTBP program to solve a variety of problems related to bridge condition assessment and management, to develop new measurement tools, and to advance knowledge of bridge design, construction, inspection, maintenance, and preservation. Specific goals include determining how and why bridges deteriorate; determining the effectiveness of various management practices and maintenance, repair, and rehabilitation strategies; examining the effectiveness of durability strategies for new bridge construction, including selection of materials; and facilitating improvements in management practices through the use of quality data. The LTBP program is a large and complex undertaking that requires a carefully thought-out process for its success. This includes active engagements between FHWA, the State departments of transportation and other government agencies, academia, and industry representatives. The overall process is iterative and will be refined multiple times during the life of the program, yielding new information. Sandra Larson, director of the Bureau of Research and Technology for the Iowa Department of Transportation, became interested in what the LTBP program could do for her State when, in 2007, she participated in a workshop organized by the FHWA to establish a framework for the LTBP program. Since then, Larson has taken an active role in the LTBP program by providing input and offering valuable information on data needs and performance issues. "We anticipate remaining involved with the LTBP program and will be sharing information with LTBP as we further our research," says Larson. The Iowa DOT goals and the LTBP program goals coincide, namely to understand better how individual bridges function and age, and then to manage our bridge assets with this additional understanding in order to extend the life of existing and new bridges through timely and appropriate maintenance and rehabilitation. Iowa has a growing program of bridge investigation through load testing, non-destructive evaluation and sensor monitoring which provides in-depth information about our existing bridges to better understand bridge behavior, condition and capacity. "Sharing information about our program and following the LTBP program closely will help to leverage our time and expertise as we all continue to mine these technologies for more answers and insight into bridge condition and behavior," she says. Larson is particularly interested in how the LTBP program will help Iowa to better assess the current condition of bridge decks so that bridge managers can make the optimal decisions regarding the timing and extent of maintenance and repair. This is a matter of concern for most of the bridge community and something the program will address. Ultimately, the increased knowledge and understanding of bridge performance and behavior will result in more informed bridge repair and rehabilitation programs. Sharing information nationally between the LTBP program and State's bridge management programs will benefit everyone. The LTBP program is conducting a detailed, in-depth examination of the current state-of-the-practice in understanding and assessing bridge performance. The developmental phase has two primary objectives. First, work on this phase defines the core needs of the bridge community and lays the foundation for the entire program. It determines the critical bridge performance study topics for the LTBP program, the existing data gaps in bridge knowledge, and the methodologies and protocols to collect the required data. Second, it will develop a strategy for transferring the knowledge gained from the program to the bridge engineering community. The logical starting point for the LTBP program's path to improved understanding of bridge performance is to break it down into specific issues and evaluate the existing gaps in knowledge that hinder understanding. In the early development of the LTBP program, it became clear that the definition of bridge performance must be responsive to the needs of the primary stakeholders: the State and local transportation agencies and private road authorities that own and manage the bulk of the Nation's bridge infrastructure, along with Federal agencies and the bridge engineering community at large. These stakeholders are the ones who will apply the knowledge and lessons learned from the LTBP program. 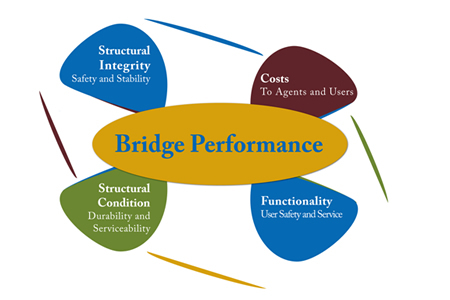 To best serve these stakeholders, one of the early program decisions was to establish an overall definition of bridge performance that addresses four broad categories: structural condition, structural integrity, functionality, and costs. A critical factor in developing a more specific definition of bridge performance was outreach to the States. Focus group meetings were held at the offices of 15 State DOTs throughout the country. These States were selected on the basis of size, and geographic and climatic conditions to ensure broad national representation. The focus groups consisted of DOT experts responsible for the design, construction, inspection, management, and maintenance of bridges. The purpose was to determine the aspects of bridge performance that are considered the highest priorities by these DOTs. The major findings were remarkably similar from State to State. Regardless of the geographic region, high on the list of priorities were performance issues related to concrete decks, joints for bridge decks, scour at substructures, and deterioration of concrete substructure units. The approaches each DOT currently takes to these problems differ widely, but there was a consistent desire to understand the performance issues better and to refine or revise the approaches to ensure better performance. Based on the input from stakeholders, the LTBP program has identified 20 bridge performance issues and grouped them into like categories. To augment this, substructure and foundation performance issues were discussed in a special workshop conducted by the FHWA. With the critical bridge performance issues defined, the next step of the program is an in-depth evaluation of each performance issue by examining the existing knowledge base and identifying critical gaps in the current knowledge. This requires identifying the specific parameters that will be useful in characterizing the issue, identifying the methodology required to obtain high quality data for each parameter (i.e., deciding amongst visual inspection, destructive or nondestructive testing, and sensors for short- or long-term monitoring), and adopting or developing specific data protocols for each of the chosen data collection methodologies. In order to efficiently manage, organize, and utilize the vast amounts of data that will be gathered throughout the program, an open, scalable, and extensive data management and analysis infrastructure has been developed. The system is capable of integrating LTBP data with other data from multiple sources, such as National Bridge Inventory (NBI), PONTIS, weather, and traffic, thereby providing a single source of information for researchers, bridge owners, and other stakeholders. This central database allows researchers and users to process and analyze a wide variety of data to develop more accurate bridge performance models and do large scale testing of research hypotheses. This tool is not available for public use, at this time. However, once available, users will be able to access and query the data warehouse anytime from anywhere via a state-of-the-art web-based application, the Bridge Portal. Users can search for bridge structures based on cross-domain criteria, such as bridge type or age, weather statistics, traffic information, geographic area, and condition ratings from the past 20 years. Advanced visualization tools provide a map-based user interface and dynamic, graphical presentations of query results. Built in statistical applications allow the user to compare a specific bridge to the average condition ratings of structures of a similar type, age, or location. 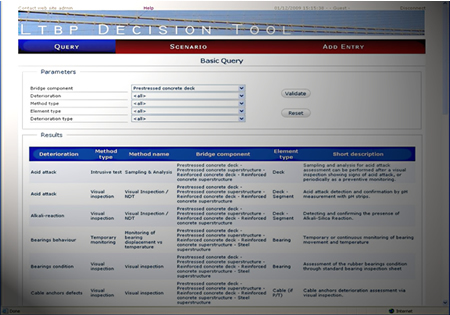 While the data infrastructure provides a powerful tool for data mining, another LTBP software tool, the Bridge Assessment Decision Tool (BDT), is being created to query data collection protocols. During the developmental phase, common bridge health monitoring and inspection techniques were reviewed and data collection protocols that will be used throughout the program were drafted. These bridge evaluation techniques will cover numerous data types and cover all the critical bridge performance and deterioration issues noted above. The BDT, currently an internal tool, houses these protocols in a database and makes connections between the specific measurement and evaluation techniques, general types of techniques (visual inspection, NDE, monitoring, etc), data types, types of deterioration, and bridge components. A web-based application then allows users to run queries using these connections as search criteria. A query returns the protocol sheet for a given measurement technique, including a detailed description, equipment required, technique procedure, suggested frequency of use, and output data. This tool will lead to data collection that is uniform and consistent in the duration of the LTBP program. Figure 5. LTBP Decision Tool. Software helps to break down data for analysis. Figure 6. Group photo of FHWA's LTBP Geotechnical Workshop attendees. The FHWA Long-Term Bridge Performance Program hosted its first geotechnical workshop, "Identifying Bridge Substructure Performance Issues," in Orlando, Florida, March 4–5, 2010. Participants (pictured) represented State highway agencies, Federal Highway Administration, academia, and consulting. The transportation leaders also included a cross section of structural, geotechnical and hydraulics engineers. The purpose of the workshop was to consider overall bridge performance and identify geotechnical performance metrics or indicators that correspond to good and poor performance. The LTBP program was provided with recommendations on how to identify, prioritize, and address substructure and foundation performance issues. Visit https://www.fhwa.dot.gov/research/tfhrc/programs/infrastructure/structures/ltbp/ for full article. Join us on Tuesday, July 13th from 11 a.m.–1 p.m. as we discuss the LTBP program's latest developments. The two-hour mini-symposium, titled "Bridging the Data Gaps for Effective Management," will cover seven sub-topics on bridge performance and management. To join the LTBP mailing list or for more information, contact us at ltbp@dot.gov.